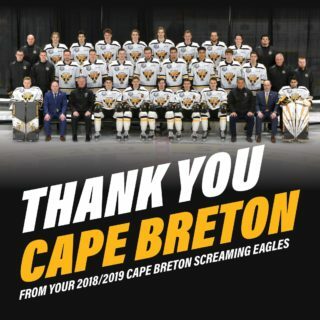 QUEBEC- The Screaming Eagles started their three game road trip with a convincing 6-1 victory in Québec City. There was no signs of a blowout in the opening twenty minutes, as the first period was a fairly pedestrian affair. There were just two minor penalties, coincidentals for Ty Fournier and Mikael Robidoux and each team fired just eight shots on goal. But both teams would strike in the opening twenty minutes. It was the home side that opened the scoring, courtesy of Gregor MacLeod. MacLeod cut in from the right corner of the ice, and tipped a point shot from Etienne Verrette to make it a 1-0 game. The Eagles would counter with a goal from Ryan Francis, who flew up the right wing and wired a shot over the shoulder Antoine Samuel. Things would stay even almost halfway through regulation as well, with both teams failing to score on a single power play each. 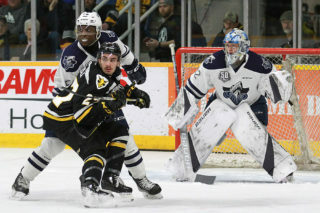 Then a bounce would go in favour of the Eagles when a Phélix Martineau shot went off the upper body of Samuel, and would bounce up and over the Remparts netminder to give the visitors a 2-1 lead. It looked like the period would end that way but with 13 seconds left Gabriel Proulx fired a rebound past Samuel. 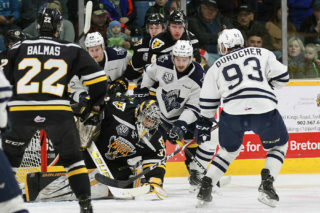 The Remparts goaltender dove to cover the puck, and there was muted celebration from some of the Eagles players and no immediate signal from the referee. The play was then called a goal, and was upheld after a video review. Cape Breton held a 3-1 lead heading into the final frame, where video review would come into play one more time. Ty Fournier had taken three trips to the penalty box in the first forty minutes, but had been making his presence known with his physical play and the power forward would use his size to make it 4-1. Driving the net and capturing his own rebound Fournier made it a 4-1 game at the 4:29 mark of period three. Video review made it a 5-1 game before- and after- the halfway mark of the third period, in the same sequence. Martineau would flip a shot from above the crease past Samuel that hit the post and rolled along the goal line. Play continued on for a full two minutes with no goal call on the ice. The play was reviewed and it was determined that the puck crossed the line, and an additional two minutes were added to the clock with the Eagles up 5-1. Adding time would do Québec no favours, as the final goal would go the way of the visitors. Egor Sokolov would ting the twine with 90 seconds to play and it was 6-1 victory in the books for the Screaming Eagles. Jessiman picked up the win, stopping 31 of 32 shots. Samuel allowed six goals on 32 shots in the loss. Cape Breton continues the road trip with a visit to Chicoutimi tomorrow night. 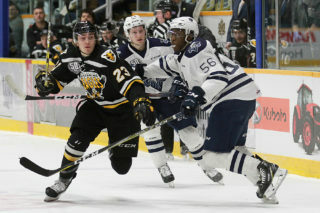 Puck drop against the Saguenéens is 8:30 PM Atlantic time, and you can catch all the action starting with the pre-game show with Patrick McNeil at 8:00 on 1270 AM CJCB or online at http://www.cjcbradio.com.